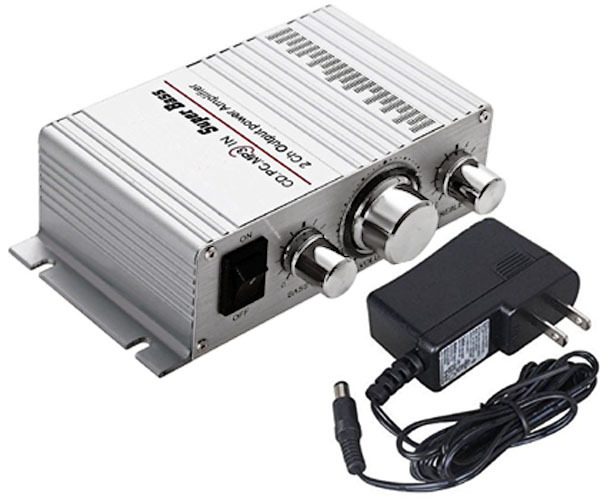 This mini stereo amplifier is designed to boost the audio output of virtually any line level audio source such as TV audio, game consoles, MP3 players, CD player, computer, iPod etc for receiver or speakers with impedance rating of 4 to 8 ohm . This small but powerful stereo amp has low audio distortion, wide frequency response and low noise. It can provides a clearer, stronger and more powerful sound. One little gadget to transform your stereo music to thrilled sound for party or outdoor events. This amplifier supports audio source equipments that output in RCA L/R or 3.5mm stereo mini type. The boost level or volume control is the rotary dial on the front panel. This mini amp adopts the latest in IC-based amplifier technology delivers smooth, natural sound without fatigue or distortion, great for recording and home theater event. This mini power amplifier provides max 40 watts (20W per channel) for stronger and more powerful sound for musical enjoyment. Perfect for using on any desk, countertop, workbench or car stereo. Easy rotary dials on the front panel for individual tremble and bass level tuning. Users can have complete control on the desired high/low frequency sound for enhancement and powerful sonic quality. A volume control dial on the front panel for variable line level output for controlling volume level of any RCA line level audio signal from Hi-Fi system, CD player, game console for remote location. This mini amplifier provides the gain needed for audio signal to be transmitted over long cable wire without loss of quality. This mini amp provides users with an excellent solution for raising the sonic level from low-volume source such sa iPod, MP3/MP4, iPad, Tablet to normal line level for improved clarity of sound before feeding to amplifier, speaker or home theater receiver. Its aluminum chassis provides enough cooling. No built-in fans or additional cooling are necessary. Small but powerful stereo amplifier with low audio distortion, wide frequency response and low noise. Featured with 1 RCA Stereo L/R input and 1 of 3.5mm min stereo Input for portable, mobile audio device or car stereo. Boost low-level audio inputs to the normal line level for recording or driving amplifier or receiver properly. Max output power up to 40 Watts (20W per channel) for stronger and more powerful sound for musical enjoyment. 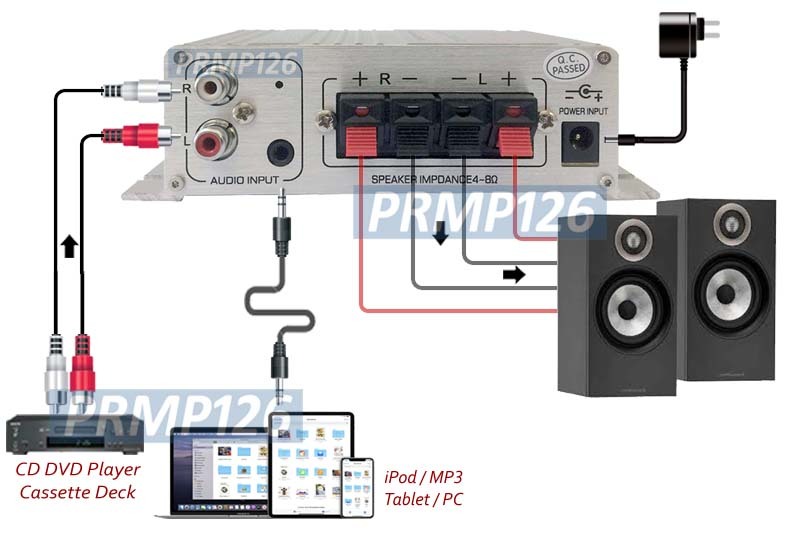 Boost the sound output form iPod, MP3/MP4, iPad, Tablet, cassette player, TV and mobile devices. External volume controller for any audio source device or stereo amplifier that has no output level or volume adjustment of its own. Supports adjustable Treble and Bass levels through rotary dials on the front panel. Excellent solution for raising the sonic level from low-volume device to normal line level for improved clarity of sound before feeding to amplifier or home theater receiver. Adopting the digital amplifier technology delivers smooth, natural sound without fatigue or distortion. Work with speakers with impedance rating of 4 to 8 ohm. Light-weight aluminum alloy case that easily distributes the heat and for durability. 12 DC power adapter included.